Trumpeter swans were once thought to be extinct in the U.S., thanks to people who hunted them for their soft feathers. Now, as this video attests, they are back in full force. Every year, more than 2,000 of the largest waterfowl species on Earth flock to a backyard Monticello, Minnesota, where they spend the winter. The birds have been coming to the spot for over 25 years, after a local resident Sheila Lawrence (colloquially known as "The Swan Lady") began feeding just a few of them along with some ducks. Before she knew it, so many more swans came each year that they now consume about 2,000 pounds of corn each day. While some trumpeter flocks (especially those that have been reintroduced through breeding programs) do not migrate at all, other flocks migrate only as far south as areas like Minnesota, Wisconsin, Michigan and Ontario. This particular group is the highest concentration of trumpeter swans east of the Rocky Mountains, and draw hordes of tourists to the town each year. Trumpeter swans were once thought to be extinct in the U.S., thanks to people who hunted them for their soft feathers. Now, as this video attests, they are back in full force. Every year, more than 2,000 of the largest waterfowl species on Earth flock to a backyard Monticello, Minnesota, where they spend the winter. The birds have been coming to the spot for over 25 years, after a local resident Sheila Lawrence (colloquially known as "The Swan Lady") began feeding just a few of them along with some ducks. Before she knew it, so many more swans came each year that they now consume about 2,000 pounds of corn each day. While some trumpeter flocks (especially those that have been reintroduced through breeding programs) do not migrate at all, other flocks migrate only as far south as areas like Minnesota, Wisconsin, Michigan and Ontario. 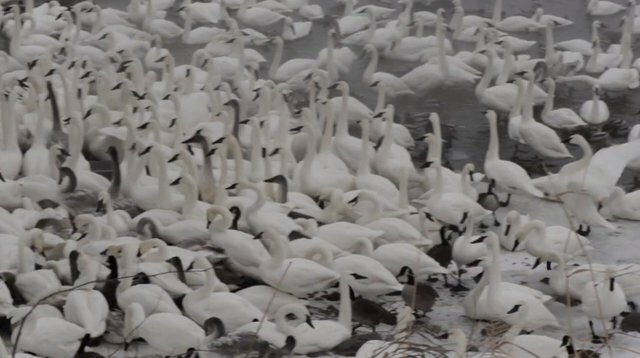 This particular group is the highest concentration of trumpeter swans east of the Rocky Mountains, and draw hordes of tourists to the town each year.